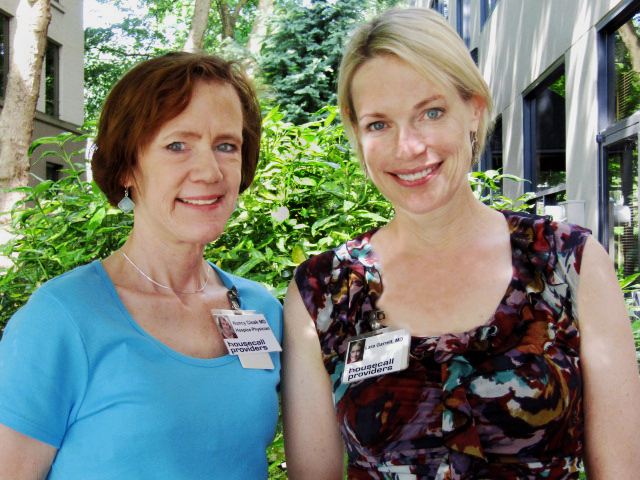 Hospice physicians Nancy Cloak (l) and Lara Garrett. Dr. Nancy Cloak has recently been named Housecall Providers Hospice Medical Director. A board certified psychiatrist, Dr. Cloak has been working as a hospice physician at Housecall Providers since 2014. She is succeeding Dr. Lara Garrett who has been the interim hospice medical director this past year. “We are thrilled that Dr. Nancy Cloak has accepted a leadership position within our hospice. Nancy exemplifies the most important qualities of a hospice medical director, a commitment to excellent end-of-life care, honoring patients’ goals of care and a compassionate heart,” said Hospice Program Director Rebecca Ashling, MSN, RN. Nancy received her medical degree from the University of South Florida and completed her residency at the prestigious Menninger Clinic in Houston, Texas. Following residency, she worked as a psychiatrist with medically complex patients in a variety of settings, including geriatric, palliative care, and eating disorder treatment centers. She was drawn to end-of-life care after being a caregiver for a loved one that was on hospice. Nancy finds that providing end-of-life care blends her abiding interest in general medicine with the best parts of being a psychiatrist, listening and working with a multidisciplinary team. While she was conscious of hospice care long before working at Housecall Providers, the experiences that she has had as a member of the care team have confirmed that she is on the right path. Hospice work has led to some of her most profound and integrative professional experiences. “I’ve been able to see teams work skillfully and beautifully, combine my knowledge of physiology and pharmacology with psychotherapeutic interventions, and reflect on the questions of mortality and meaning that surround us all,” she revealed. Nancy has also been an enormous educational resource for the team presenting often at the weekly hospice interdisciplinary meeting on topics that include prognosis for various medical conditions, communicating with families about hospice medications, and addressing mental health issues in hospice patients. And it appears the admiration runs in both directions. “I’m deeply honored by the opportunity to serve, learn from and be a leader in this extraordinary organization,” she said.